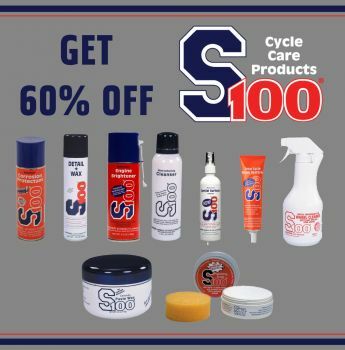 We stock a full-range of S100 Cycle Care Cleaning Products and highly recommend them and right now, they are 60% OFF! Here is what each of these products do and why you should choose them over other cleaning products. Shine-Enhancing Cleanser - The S100 Cleanser gently removes water spots, small swirl marks and embedded road film to set up the surface for the ultimate shine, all without scratching even sensitive clear coats. Polishing Soap - The perfect weapon in that fight against dulling and tarnishing for larger areas. This just might be the world’s fastest way to polish! Engine Brighter - The S100 Engine Brightener can take a tired, greyed-out engine and make it look almost factory-new again! Detail & Wax - S100 Detail + Wax removes dust, spots, and bug residue and replaces them with a “gangbusters” shine. Wheel Cleaner - Neither acid, nor lye-based like cheaper products, S100 Wheel Cleaner provides complete surface safety for any type of wheel or wheel finish, including those tricky anodized finishes. Carnauba Paste Wax - Free of abrasives and cleaners and made with a unique blend of carnauba (the world’s hardest wax) and beeswax, you will be amazed at the depth of shine and darkening of dark colored surfaces. Corrosion Protectant - Unless you live in the desert, you always have to be on the lookout for that dreaded “enemy number one”, corrosion. Special Surfaces Cleaner - New S100 Special Surfaces Cleaner is a waterless spray-on, wipe off cleaner that cleans up fairings, helmets, visors, instruments and windshields in seconds. Safe for use on polycarbonate and acrylics. If you want any more information about the S100 range of Cleaning Products, give our Parts team a call on 08 9458 6754 or visit the Dealership to check them out. All Image & Text Sourced from S100 Website.